We’ve crafted a Wee Heavy Braggot showcasing bold flavours of honey and caramel, balanced with the aroma of peat smoke. A braggot is a beer in which the sugars are derived from both malt and honey; for our Wee Heavy Braggot, the all important honey is from our good friends at Fallentimber Meadery and our choice of British malts pays tribute to this brew’s Scottish undertones. Perfect to share with your favourite lad or lass! 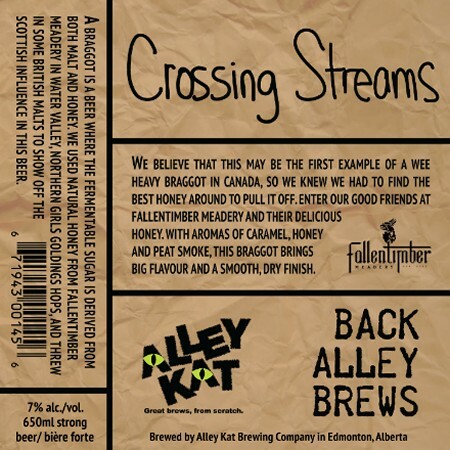 Crossing Streams will be officially launching on Thursday March 8th, and will be available in 650 ml bottles at Alley Kat and select retail stores in Alberta while supplies last.